SJ Mueller is the Associate Creative Director for Daybreak Game Company’s award-winning massively multiplayer online action game, DC Universe Online (DCUO). SJ is responsible for driving the narrative, story and overall player experience in the game to create compelling content that fully immerses players in the DC Universe Online world. 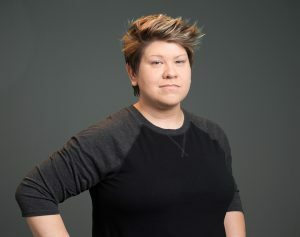 She graduated from the University of Houston with a degree in Media Production and has been working in the video game industry for more than seven years. 14 DCUO content DLCs — yes, 14! I am currently nostalgia-gaming and have rolled a character on “Ragefire,” the recently-launched “EverQuest” progression server. Talk about a trip down memory lane! I have also picked up the “Dungeons and Dragons: Legend of Drizzt” table top game. Sometimes, it is good to go back to your roots. I have absolutely loved video games my entire life, though it didn’t occur to me for a long time that it was a career option. So in college, I studied visual design, film and writing. Shortly after graduating, I realized that there were many opportunities in the video game industry that would let me flex my creative muscles, so I gave it a shot. Fast forward seven years later and I’m still in love with games. Years ago, as a wide-eyed, fledgling creative, I gave an amusing, yet unnecessary bit of voice over (VO) direction to Mark Hamill (he is the voice of the Joker in DCUO). When we came upon a line of dialogue with an “ape” pun, I had an opportunity to wield my impressive DC comics’ knowledge! With fervor, I explained the nuances and subtle differences between the DC simian characters, Gorilla Grodd and the Ultra-Humanite, to Mark. He politely let me finish and replied with “Yeah…That’s really going to affect my performance.” We all shared a laugh and I learned a valuable lesson about VO direction – don’t always sweat the contextual details. And it probably goes without saying, but Mark Hamill does one heck of a Joker. I was honored to be chosen to participate in a DCUO video series chronicling the 75th anniversary of Batman and the character’s development for the game. In the video, my segment follows Jim Lee’s portion and segues into Kevin Conroy’s interview. Ten-year-old me would have never believed that someday I would get a chance to be surrounded by my heroes. “Luck is what happens when preparation meets opportunity.” The ancient Roman philosopher, Seneca didn’t say that to me directly, but I’ve found the heart of it to be very true. Be prepared and position yourself to be ready for any opportunity that may come your way. When that chance comes along, if you don’t have the skills and preparation, that moment will pass you by. Never wait on others to give you the training or skills – go get them, and be ready. I am three degrees of separation away from Kevin Bacon. I am excited about the increasing diversity, both in terms of representation and types of games. The industry is still growing and with that growth, comes the opportunity to do something new or different. Some of the larger studios focus on exhilarating, action-packed blockbusters, while others create smaller stories with compelling game mechanics. Both can really touch your heart. For example, “Mass Effect” was an epic series filled with diverse characters and it literally took me years to complete that journey. On the other hand, I completed the indie game “Brothers” in a single afternoon, but it too was an unforgettable and moving experience.